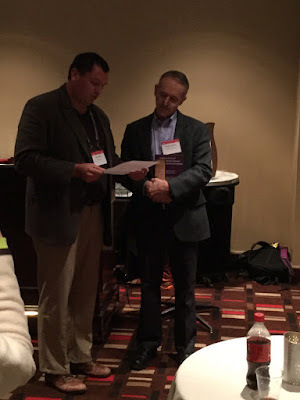 Here is a report from the session on Christian Apocrypha joint with Papyrology and Early Christian Backgrounds at SBL Atlanta on 21 November. The first paper in this session was presented by Geoffrey Smith who always has very interesting presentations. Some years ago, he presented on a new amulet which contained Mark 1:1-2 (without "Son of God" to the great satisfaction of Peter Head who sat next to me; it was then I decided to write an article on that topic). This time he presented a "Preliminary Report on the 'Willoughby Papyrus' of the Gospel of John and an unidentified Christian Text." 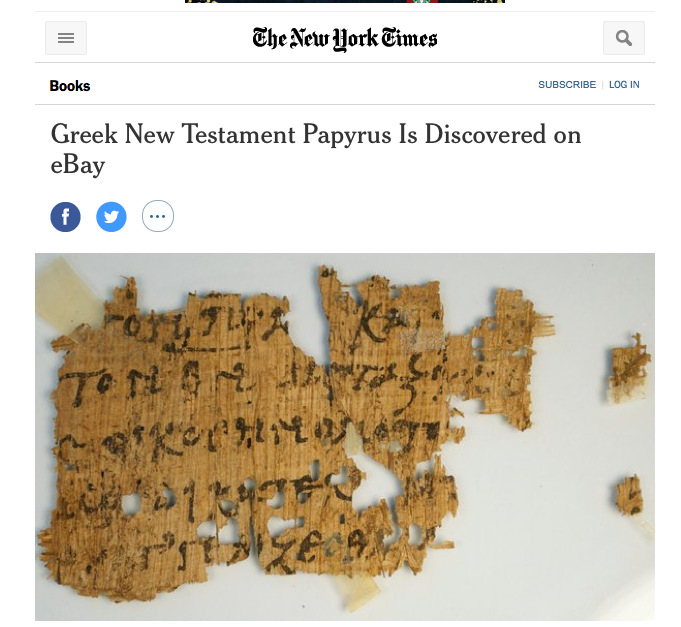 Just before the SBL, the papyrus was featured in the New York Times (see blogpost here). We already knew that it was found in the possessions of the late Harold R. Willoughby, a well-known scholar and bibliophile (who was also involved in the purchase of Archaic Mark by the University of Chicago). Apparently, if I remember correctly, a relative of Willoughby pulled out a drawer in a box on an attic, and the manuscript fell on the floor. There was also this small inventory list mentioning other MSS, which have not been found. the papyrus. He took images of the MS in March, which he showed in his presentation. The fragment has now been registered as Gregory-Aland Papyrus 134. The MS was folded at least once in Antiquity, possibly it was folded twice. (However, as someone pointed out, the folds can simply be the result of the papyrus roll being pressed together.) The recto contains six fragmentary lines with text from John 1:49-2:1 (end of the calling of Nathanael, beginning of wedding in Cana). The lines are rather long (only about half of each line is extant, and in our reconstruction, we do not know to what extent lost letters came before or after the extant text). The verso is an unknown Christian text which is not reconstructable from any known text in the TLG database. There are nomina sacra on both sides. The same scribe seems to have copied both sides in an informal cursive hand. Smith dates it to 250-350. In sum, there are notable (unusual) features with this MS: (1) God (θεος) in v. 49 is not abbreviated as a nomen sacrum; (2) The continuous text is written on the recto of a scroll; (3) The verso contains an apocryphal text. In regard to nomina sacra, there are other examples of scribes who were inconsistent, e.g., πνευμα in P46 is not always abbreviated (as noted in a recent article in NTS). In regard to the unusual format, after John was copied, the MS was flipped and written on the other side. This text was written up-side-down, which is normal on a bookroll, if you want to read and unroll the second text after you have read the first text (as noted by Brent Nongbri in the Q/A; apparently, P. Oxy. 654 is an exception in this regard). However, could the MS have been an amulet which was reused later? Both the dialouge with Natanael and the wedding at Cana hare texts attested in other amulets (P. Berlin 11710 and P. Vindob. G2312, respectively). But the presence of both texts in a continuous narrative makes Smith doubt this identification. Could it be a hermeneia, or a writing exercice? We cannot know. In the Q/A session, several things came up. For example, the fact that in the corpora we have from Oxyrhynchus of some 180 published ophistographs (reused rolls), a documentary roll is normally reused for a literary text, or, vice versa, a literary roll is used for documentary purpose. Only P. Oxy. 4667 (=P. Oxy. 657) is an exception with Livy in Latin and then reused for the Epistle to the Hebrews. What does it mean that the same hand seems to have copied both texts? Did it stay in the same context (library/household)? As far as info about the fragment, I don’t see anything new. What was new—at least to me—was an admission from Karen King that it could be a forgery and an update from Malcolm Choat who seems to favor forgery now. Finally, this month, Choat, the Australian papyrologist, returned to Cambridge to study the Harvard papyri on his way to a conference in Atlanta. He spent more than eight hours inspecting the papryi at the Houghton Library, supervised by a member of the library’s staff. In one spot on the John fragment, Choat detected ink where it shouldn’t be. In another area, ink was absent where it should have been present. Wrong dialect, line breaks that exactly replicated another manuscript, and now, misplaced ink: To Choat, the most logical explanation was forgery. You can read the whole article at the Boston Globe’s website. 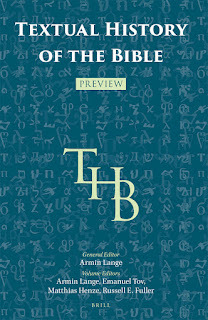 As a new type of reference work, the Textual History of the Bible (THB) aims to bring together all available information regarding the textual history, textual character, translation techniques, manuscripts, and the importance of each textual witness for each book of the Hebrew Bible, including its deutero-canonical scriptures. In addition, it includes entries on the history of research, the editorial histories of the Hebrew Bible, as well as other aspects of text-critical research and its auxiliary fields, or Hilfswissenschaften, such as papyrology, codicology, and linguistics. The THB will be the first reference work of its kind.It brings information to the attention of textual critics in particular, and biblical scholars in general, which was previously only known to highly specialized experts. At the same time, it invites its readers to participate in the scholarly debate by giving voice to dissenting opinions in its entries. The treatment of each version could be considered a small monograph in its own right. The THB is groundbreaking in several respects. It pays special attention to the secondary readings in MT and is first to offer a systematic study of the textual character of the non-aligned Hebrew texts. The THB pioneers the study of many primary translations, for instance it features an analysis of the translation technique of the Vulgate. It is furthermore, the very first tool that devotes significant attention to the secondary translations. While the study of the Hebrew sources and the primary translations are usually based on editions, the secondary translations are usually studied from manuscripts. 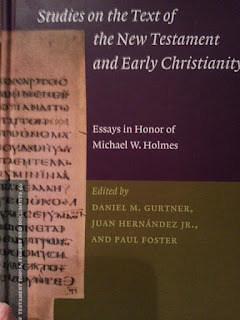 THB is a good starting point for text-critical analysis of all biblical versions and books because it offers the reader information about all the textual evidence for a specific biblical book and all the evidence for a specific textual source in one reference work. The Hebrew Bible, editors Armin Lange and Emanuel Tov. 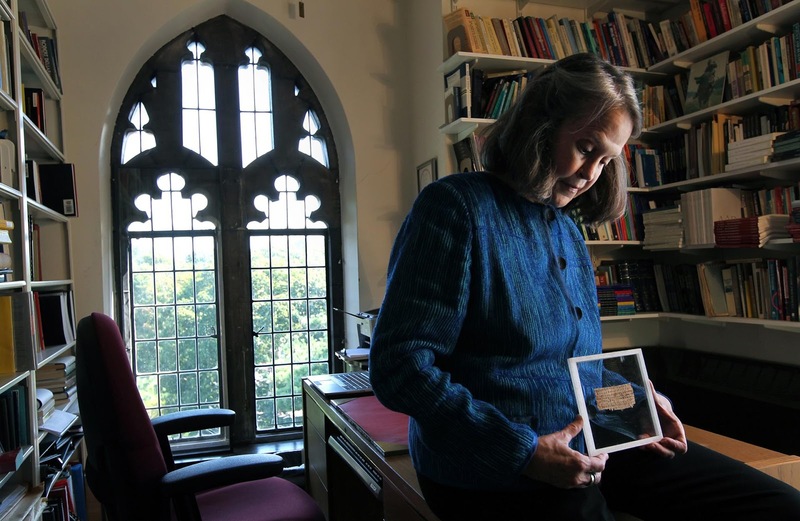 For many biblical versions and/or biblical books, the THB has sparked new research. With the publication of THB 1, Brill publishers will therefore launch a peer reviewed supplement series which will include monographic studies, scholarly tools, and collective volumes on the Textual History of the Hebrew Bible. All THB authors and readers are invited to contribute. As expected from Brill, the price is steep. Online access is €2.700 / $3,250 with print pricing yet to be announced. You can get more detail on the four volumes and read several entries in the free online preview [PDF]. Mike was presented with a Festschrift at SBL. 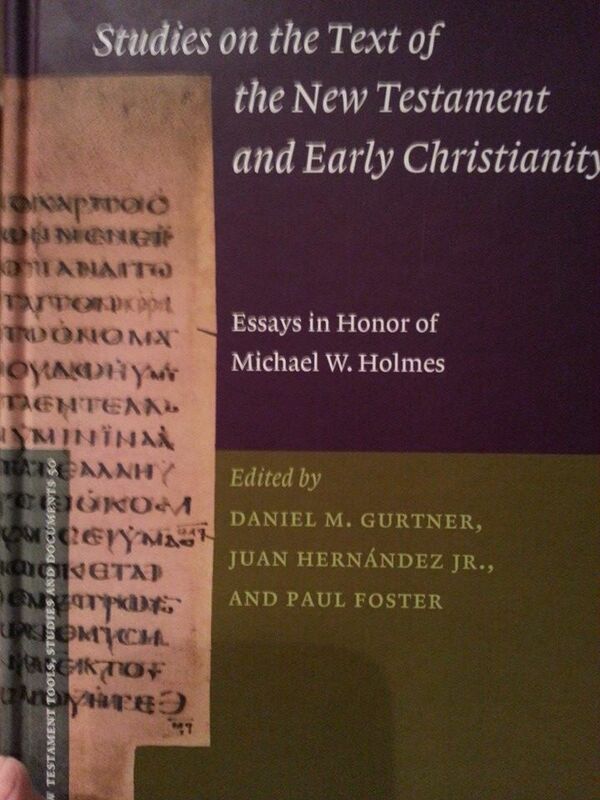 Congratulations to him and the editors and all the contributors (see below). Dan Gurtner presenting the book to Mike (HT HH); the cover (HT JH); and the contents. 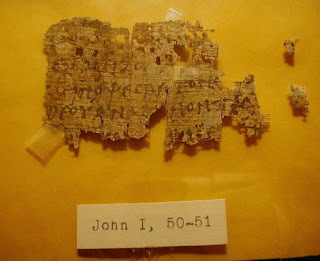 Formerly in the possession of Harold Willoughby of the University of Chicago, this unpublished fragment of the Gospel of John in Greek created a stir when it appeared briefly on a well-known auction site in January of 2015. Having obtained permission from the owner to edit and publish the manuscript, I will offer in this presentation the initial results of my analysis of the so-called “Willoughby Papyrus.” I will demonstrate that this fragment complies with the 1970 UNESCO convention on cultural property and discuss the circumstances of its discovery and rediscovery. On the basis of new images of the fragment, I will also provide a transcription of the text, discuss its apparent bookroll format, and assess its text-critical value. Finally, I will present the secondary text on the verso and entertain the possibility that it belongs to an otherwise unknown Christian apocryphal text. 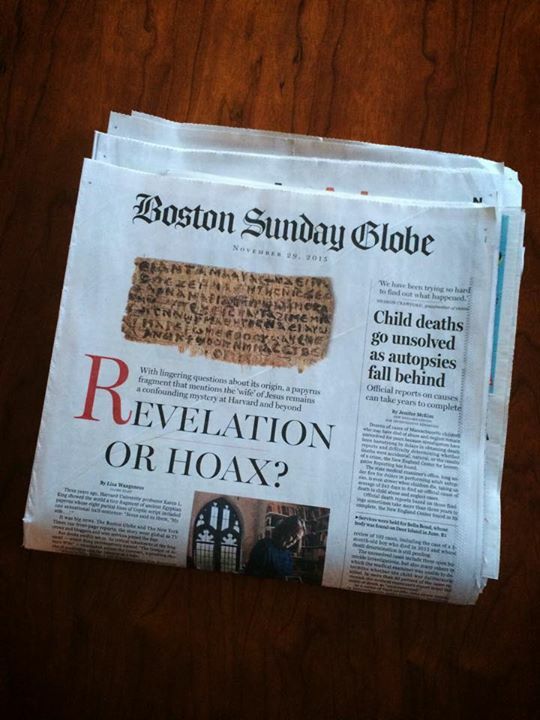 The papyrus made it to the news in New York Times yesterday with an image of the verso with the secondary text (apparently up-side-down compared with the recto). According to the description, the seller is a relative of Mr. Willoughby. We will see if Geoff Smith has more to say today. 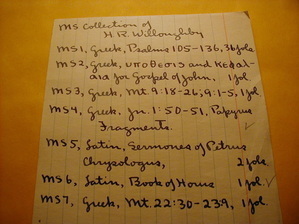 Brice Jones also mentioned the accompanying note which listed several other items in Willoughby's collection. 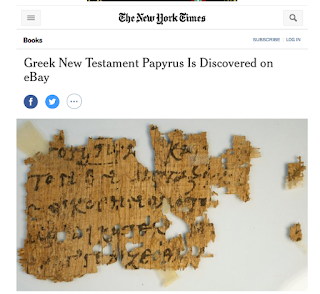 According to the list, the papyrus was one of three Greek New Testament manuscripts which seemed to be unregistered and without Gregory-Aland numbers. The image is sufficient enough to attempt an analysis of the handwriting. The letters slope slightly to the right, are separated, undecorated, and roughly bilinear. The middle element of ψ descends well below the line, the oblique of ν connects high up on the second hasta, ο is small, the saddle of μ low. There is little contrast between thick and thin strokes, and punctuation and tremata are absent. This is a good example of what C.H. Roberts described as a “reformed documentary” hand and it exhibits many features typical of papyri that have been dated palaeographically to the 3rd-4th centuries. P.Oxy. 1079 (P18, 3rd-4th century) is a good example of this type of hand (cf., in particular, ν, ο, ε). While all palaeographical dating is inevitably tentative, the general impression of the handwriting suggests a date of 3rd-4th century. The text is from John 1:50-51. I have provided a provisional transcript below in both diplomatic and full forms. 3: It is not clear whether the papyrus reads μείζω (NA28) or μείζων (P75 037 579 1424 l 2211). 4: ὑμῖν ὄψεσθε follows the text of NA28 along with P66 P75 01 03 020 032s over against the reading ἀπ' ἄρτι found in many manuscripts whose scribes harmonized to Matt. 26:64 (including 02 017 036 037 038 Maj et al.). 5: Oddly, the scribe wrote the nomen sacrum θεοῦ in scriptio plena; cf. l. 6. 6: There is a faint trace of a supralinear stroke above the ν of υἱόν. ἀνθρώπου is also abbreviated. –: The text appears to read καί τῇ τρίτῃ [ἡμέρᾳ], which is attested in some manuscripts (03 038 f13) over against the wider tradition. I will post a brief report on Geoff Smith's presentation today, here in Atlanta. 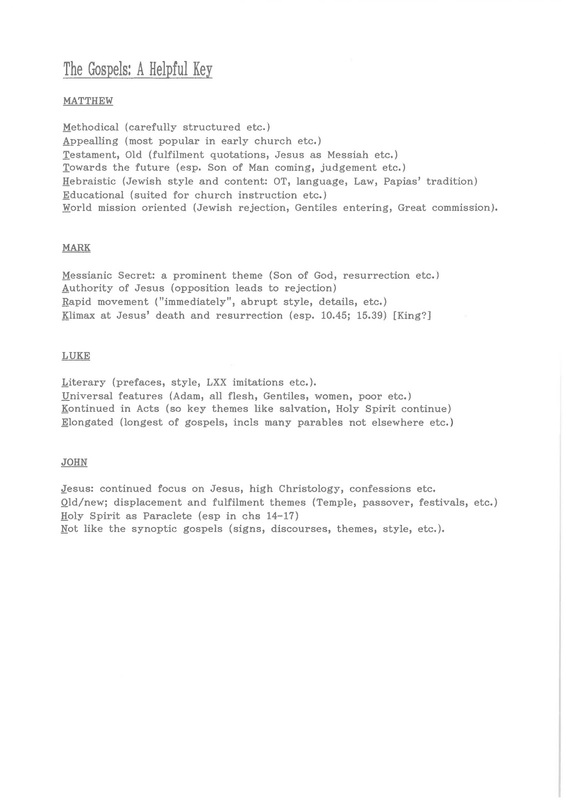 Six years ago, at another SBL meeting in New Orleans, Geoff Smith presented a paper on a “New Oxyrhyncus Papyrus of Mark 1:1–2," which I reported about here and here (an except from my larger article on Mark 1:1). The question is whether this might be another amulet. This year’s annual blog dinner will be held at Pitty Pat’s Porch, an excellent Atlanta establishment whose ambiance and cuisine hearkens back to the classic novel and motion picture Gone with the Wind. All who are interested in biblical textual criticism are welcome to join. The reservation is for 7:30pm on Sunday night (22 Nov), which follows the Novum Testamentum Graecum session. We have requested the group menu in order to expedite service, to insure competitive pricing and to secure private seating. The two main meal options are fried chicken or BBQ ribs, with an extensive sideboard replete with copious traditional southern cuisine. There is also a vegetarian option involving grilled vegetables. The meal costs $38.40 all inclusive (drinks, meal, dessert, tax and gratuity) or $21.76 if you are a student. Please RSVP via email or (preferred) by commenting to this post. Eisenbrauns is running a special sale on textual criticism starting today (when ASOR opens) which runs through the following Tuesday evening (when AAR/SBL closes). All that is required is to put the title(s) in the shopping cart. At check-out, one needs to indicate "ATL40" in the purchase order field. Customer service will apply the discount before the order is billed and ships. My book, The Epistle of Jude: Its Text and Transmission (reviews here) is offered for $30. The call for papers and booking forms are now open for the Sixth British Patristics conference. The conference will be held at the University of Birmingham from Monday 5th to Wednesday 7th September 2016. Proposals are invited for papers on any aspect of patristic study. We are particularly keen to receive contributions on the reception of Pauline literature or commentaries more generally. As in previous years, we expect to organise two or three thematic sessions running in parallel. Proposals should be submitted with an abstract of up to 250 words through the conference website by 30th April 2016. 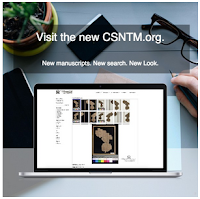 New Manuscripts – We will be adding 10-20 new manuscripts to our website weekly for the next few months. These will be from the National Library of Greece in Athens (our ongoing project for 2015–16), as well as previously unposted images from hundreds of manuscripts and rare books in our collection. New Look – We have revamped our entire website to make it both simpler and richer in content. We have new content, which narrates how we go about digitizing and archiving manuscripts. We also explain what goes into our extensive training program that enables our teams to work quickly while capturing high-quality images. 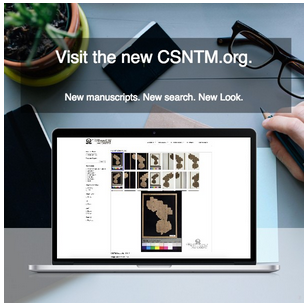 New Viewing Environment – The website is equipped with a new viewer, which makes it easier than ever to navigate manuscripts and view our stunning new images. New Usability – Our new site is also designed to work perfectly with mobile devices and tablets, enabling you to view manuscripts or to access other resources quickly, whenever you need them. New Search Features – The website is now outfitted with an extensive search functionality. Searches can be performed at the manuscript level, allowing you to find manuscripts that meet certain criteria (e.g., date, contents, material, location). They can also be performed at the image level, which allows you to find specific features within a manuscript. For instance, we now have a Jump to Book option that allows you to find the beginning of each book that a manuscript contains. Also, one can search tagged manuscripts for verse references. Every place, for example, in which John 1.1 is tagged will automatically populate when the verse is searched. New Search Database – The search database holds tags for each manuscript and individual image. As our team continues tagging our growing collection, the search function will become more comprehensive each week. But the task is daunting. We want your help for the tagging! If interested, you can reach us via our contact page. I found this the other day while tidying up old files, and thought it might offer a change from our more usual offerings on the blog. There will be a test at the SBL blog dinner. Thinking of doing a PhD in Germany? The following came in an email from jobs.ac.uk (emails which I now have to read avidly), and looks very useful. Peter Head. Germany has over 140 doctorate awarding higher education institutions, many of which don’t charge tuition fees, and numerous prestigious and well-equipped research organisations. To help you explore the opportunities in Germany, jobs.ac.uk is holding a FREE 60-minute live video event via a Google+ Hangout on Air called ‘PhD Options: Doing a PhD in Germany’.